Home > Departments > Faculty > Holly Dolan Ed.D. 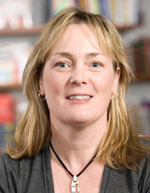 Professor Dolan's clinical work is focused at the Elementary level, and currently centers on the Jacob Hiatt Magnet School, a partner in the Clark - Worcester Public Schools Collaborative. Holly spends a considerable amount of time at the Hiatt School supervising Clark practicum and pre-practicum students and facilitating on-site seminars for both the students and their mentor teachers on a range of topics including: "Mentoring Pre-Service Teachers", "Integrating Primary Sources into the Social Studies Curriculum", and "Ways of Knowing History." Her recent research has focused on facilitating the integration of a specially designed pre-K Number Worlds math Program with "Accountable Talk" in several pre-school classrooms in Springfield, MA. She worked as a mentor and coach for the pre-shcool teachers involved in the program. She led numerous training and development workshops as well as provided on-site demonstrations in the pre-school classrooms. In addition, Holly has worked as a Teacher Development Consultant for the Core Knowledge Foundation Early Childhood Programs (Charlottesville, VA.). She provided training services for schools and agencies adopting the Core Knowledge Mathematical Reasoning the Number Sense pre-school sequence. She also Co-authored the pre-school math training module for use by Core Knowledge teacher trainers. The module covers two days of guided instruction and exploration of the Mathematical Reasoning and Number Sense curriculum for teachers adopting the program. Holly presented model lesson and provided instructional support and editing advisement for the development of the Mathematical Reasoning and Number Sense Training video, an integral part of the training module. Holly is currently finishing with her course work and will soon complete her dissertation for and Ed.D. at Clark University. Holly has both an M.Ed. (Education) and B.S. (Elementary Education and English) from Springfield College. She is a licensed elementary educator for the State of Massachusetts (gr. 1-6).